Memos can also be attached to all items in the “Document System”, including individual documents, document groups, document sets, or the entire project. However, only a single memo can be attached to an item, with the exception of within a document. 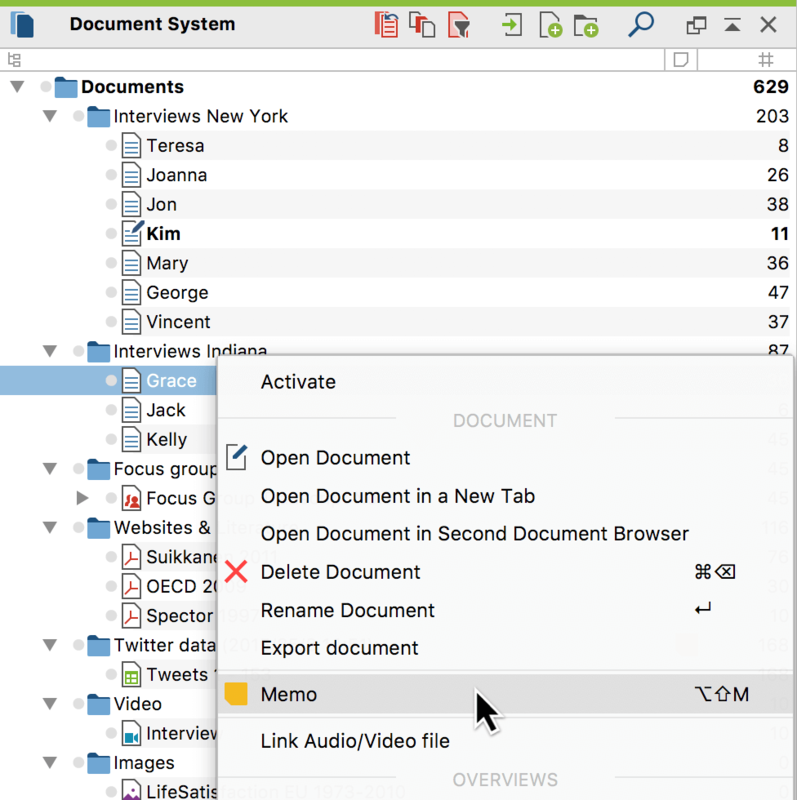 Right-click on a level of the Document system and select the Memo option from the context menu. Alternatively, you can create a memo for the currently selected document or level using the keyboard shortcut Alt+Shift+M (Windows) or option+shift+M (Mac). The fastest way is to create a new memo is to double-click in the memo column to the left of the code frequencies. The memo text field is exactly the same as that of a memo in the “Document Browser”. The memo will automatically assume the new document name as its title; this can be changed at any time. Once created, the memo icon will appear next to the entry in the “Document System” and can be opened and modified by double-clicking on it. A memo attached to the top level of the project can be used to retain a description of the entire project. The memos of individual documents can be used to store immediately accessible summaries of these texts. You can see the first few lines of a memo by hovering your mouse over it until a tooltip appears. It is, therefore, a good idea to include the most important aspects of a memo in the first few lines so that they will be displayed immediately when you hover the mouse.